Benefits of Aquatic Fitness in a MasterSpas Swim Spa; Austin TX - Paradise Spas & Outdoors Living | Hot Tub Store, Swim Spas, Patio Furniture, and More! Aerobics combines physical activity with stretching and strength training with the goal of increasing flexibility, muscular strength and cardiovascular health. Routines are generally divided into intervals that focus on each aspect individually, however, swimming allows you to address all these areas at the same time which saves time and energy while maximizing your results. What are the benefits of aquatic fitness? It offers a low impact aerobic alternative while increasing muscular strength and flexibility. This particular type of fitness routine also offers numerous lifestyle benefits that will be now be discussed in detail. In the 21st century information is the name of the game and society on a whole are a lot more educated especially when it comes to health and fitness. Many have taken to the gyms and studios in search of equipment and trainers, however, if you wish to explore your body’s untapped potential, it may be time to consider the benefits of aquatic fitness. Is Aquatic Fitness low impact? Water is load bearing so when you get into a pool no matter how heavy or light you are it will push back with an equal force to that which is being exerted on it which allows you to float. This buoyancy takes the pressure off of your bones and muscles which significantly decreases the wear your movement has on them. Does Aquatic Fitness increase muscular strength? Due to the force being exerted on your body to create buoyancy you must employ muscular strength to push through or displace the water. A wide variety of muscles must work together in a variety of ways when you attempt to swim and the movement repetition builds muscle endurance and muscular strength. Does Aquatic Fitness improve your range of flexibility? Moving through the water requires you move your arms, legs, hips, head, and spine all at the same time. This wide range of motion lengthens your body and flexes your joints, muscles, and ligaments. Can Aquatic Fitness improve your quality of life? Aerobic exercise reduces your body’s inflammatory response which lowers your risk of heart disease. It also balances your blood cholesterol level and reduces diabetic symptoms. What are the specific benefits of aquatic fitness for senior persons? The movements used to swim engages a wide variety of muscles and ligaments and stretches them. This reduces stiffness that exists with older persons and those who suffer from arthritis. It also releases endorphins which relieves pain and stress making aquatic fitness an ideal choice for senior persons. How does aquatic fitness tone your body? To move through water successfully you must engage your entire body at the same time. Doing these movements repeatedly overtimes builds muscle strength and endurance as well as burns an increased amount of calories which causes your entire body including your core to become more toned. Swimming allows you to get a complete body workout without the high impact experienced with most land-based exercise routines. It effectively and gently improves your cardiovascular health, flexibility and muscle strength. Tip the scales in your favor by exploring the unparalleled benefits of aquatic fitness. Having access to aquatic fitness in your own backyard not only elevates your overall health, you get to reap the benefits with privacy and convenience. Create your own outdoor oasis by visiting your local swim spa retailer. Paradise Spas & Outdoor Living is located in Austin Texas. 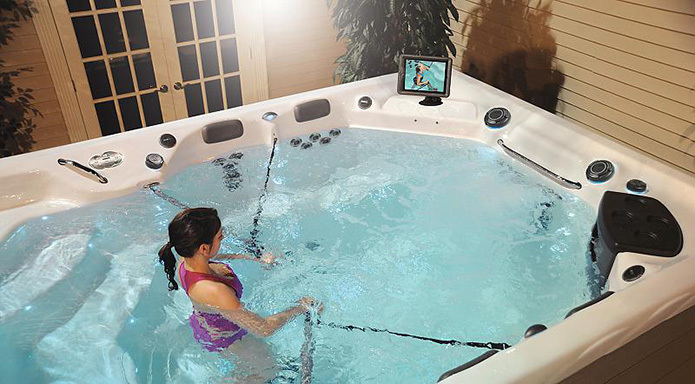 This is where you will find the highest quality hot tubs, swim spas, swim products and more! Our premium brands include Michael Phelps and H2X as well as Healthy Living and Twilight Series. We’re happy to help you create the perfect outdoor oasis. If you need help in making your selection, call or stop in – we’re always ready to help! If you are considering a swim spa, near Austin TX you have found the right place! Swim spas are affordable, conserve space, and are technologically advanced to deliver an incredible relaxing and fitness experience.